①, The submitted paper is original. ②, The paper was not published previously or not accepted for publication elsewhere. ③, The paper is not under reviewed by any other conferences or publication during the review cycle. ①, If the submitted paper didn’t follow the above “paper policy” and author didn’t fulfill the author's responsibilities, the paper might be rejected. ②, Regular paper should be below 12 pages (exclusive of the reference list). ③, Author should submit the final paper (doc & pdf versions) to the official conference email: iarce@iased.org within 15 working days after receiving paper acceptance notification. Registration is open now. For the registration form, please download by the link: IARCE 2018 English Registration Form. Please fill in and send us the form via the conference official e-mail: iarce@iased.org. Please read over the review comments, and prepare your final paper according to the review comments. Meanwhile, please adjust your paper format referring to conference template. 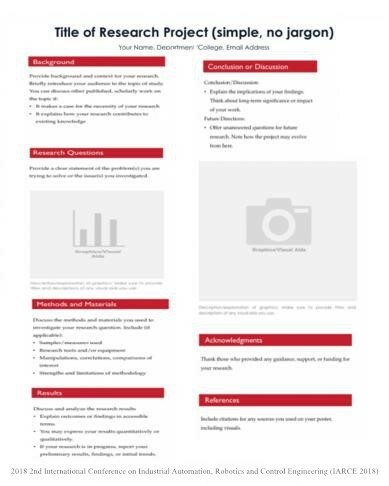 For the camera ready formatting template, please click: Full Paper Template. ①, There will be 15 minutes for each presentation (inclusive of question and answer). ②, Presenters are supposed to meticulously prepare their reports (PPT or PDF) in advance and send them to iarce@iased.org before September 10, 2018. ③,The AV facilities (Audio and Video) will be provided by the conference organizer. ④, All presentations will be photographed and some will be recorded for post-conference browse. ⑤, Each oral presenter will receive a certificate of presentation from the session chair and take photos with the session chair after their presentation. ⑥, The excellent oral presentation will be awarded the ‘Best Paper’ or the ‘Best Student Paper’. The conference chair and session chair will award the certificate to the prize winners in the award ceremony on September 22, 2018. ①, The ideal dimension of poster is A0 portrait poster (Height*Width: 1189mm*841mm or 46.8 x 33.1in). ②, Please note the conference name (full name & abbreviation) at the bottom of your poster. ③, There are no limitation of style, but one poster template as follows for your reference. ④, Posters will be exhibited from the beginning to the very end of the conference, especially in the poster session which is arranged on Saturday, September 22, 2018. ⑤, Please make sure your poster will be taken good care of during the conference. In the poster session, the poster presenter needs to stand by the poster and answer questions from other participants. ⑥, Each poster presenter (for presenters on the conference site) will receive a certificate of presentation from the conference chair in the poster session. The best poster presentation will also be chosen and awarded in the award ceremony. ⑦, The adhesive tapes will be provide for pasting poster. ⑧, Since the printing services is usually unavailable on the conference site, we’d like to suggest you to print your poster in advance and then bring it to the conference site. We sincerely welcome Distinguished experts to join us as a reviewer and a scientific committee member. We sincerely welcome you to send you cv to iarce@iased.org. IARCE 2019 will be held in Amsterdam, Netherlands. Copyright ©www.iarce.org 2019-2020 All Rights Reserved.